I put this out on Twitter earlier, and there seemed to be a lot of interest, so I figured I’d publish it here as well. 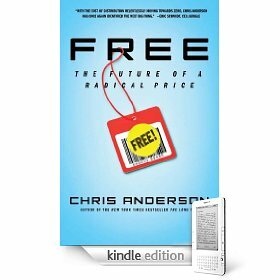 If you have a Kindle, head on over to Amazon to pick up Chris Anderson’s book Free: The Future of a Radical Price, for free. While the regular print edition will set you back $26.99, for whatever reason, the entire book is available for free right now in Kindle form. Naturally, you have to have a Kindle to get it (it’s delivered over the Amazon Whispernet network to your device), but you can also grab it and read it on your iPhone or iPod touch if you have the Kindle app. Sure, there may have been a few plagiarism issues with the book recently (maybe that’s why we’re seeing it for free in digital form, with corrections), but it’s hard to argue with the price. 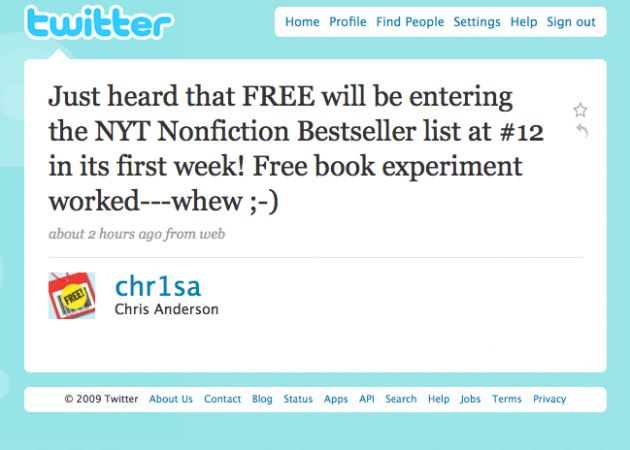 Update: And the free experiment has apparently paid off as the book will enter the NYT Bestseller list this week at #12, Anderson tweeted out earlier. Update 2: Scribd has also had it available for free since last week. I’ll go ahead and embed the whole thing below for those of you without Kindles.